Chronicles of medieval women are scarce. However, fragments of historical treasure regarding the lives and lifestyles of women can be gleaned through art, music, legal documents, correspondence, lists, and more. 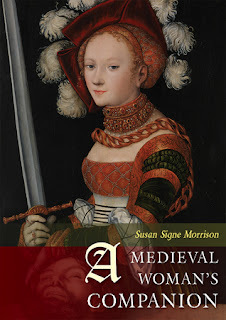 Susan Signe Morrison, Women’s and Gender Studies Outstanding Faculty Scholar (2014) at Texas State University, has fashioned such scraps of information to create a vivid picture of the past in her book, A Medieval Woman’s Companion: Women’s Lives in the European Middle Ages. This compelling compilation of historical material offers a wealth of insight into the lives of women from the Middle Ages. Introducing readers to beliefs, art and literature of the era, this book is intended for general audiences, as well as a study guide for high school and college students. With the inclusion of many direct quotes, the author provides a glossary to explain unfamiliar words and phrases of the era. A fascinating study, which will both educate and illuminate, A Medieval Woman’s Companion is recommended for home and school libraries as well as for use in educational settings, and has earned the Literary Classics Seal of Approval.